A dry cell is little can than produces low voltage DC current. When you use them in groups they are called batteries. They produce power with various chemical reactions. Coming along are new type of graphene batteries that are actually capacitors. You may only have to recharge your cell phone once a month. There are a number of different chemistries, rechargeable and non rechargeable. NiCad (Nickel/Cadmium) (obsolete), NiMH (Nickel/metal hydride), NiZn (Nickel/Zinc) and Lithium are rechargeable. Alkaline (zinc/manganese dioxide), plain (zinc/carbon), heavy duty (zinc/chloride) are not. Button batteries are even more complicated. There are 6 different chemistries and 12 different sizes. You are best to take your old battery to the dealer. These are used in watches, body weight scales, flying toys… where there is not enough space for a traditional dry cell. Lithium batteries are light weight. NiMH batteries stop working below freezing. NiZn batteries have a voltage of 1.65 to 1.85 volts, too high for devices not specifically designed for them. Some cells are rechargeable, some are not. It is dangerous to attempt to recharge non-rechargeable batteries. Alkaline last longer than zinc/carbon. 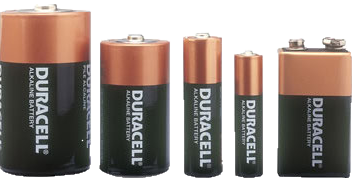 In my experience the highly advertised brands Duracell and Energizer do last longer, but not usually enough longer to justify the premium price. The problem with bargain batteries is they are likely to leak and then destroy the containing device. Oddly, the smaller AAA batteries often cost more than AA batteries. Batteries are polar. In other words, it matters which way around you put them in. The negative electrons come out the negative (-) flat base and circulate back in the positive (+) nub top. Usually you are not supposed to insert batteries all the same way. You are supposed to place them in some special pattern which will be faintly embossed on the device. If not, look for spiral spring contacts. They tend to go against the flat negative bottoms. For button batteries, one side of the disk has a (+) engraved on it. Usually that side is up when you insert the battery. There will be contacts for bottom (-) pole of the battery and on the edge for the (+) pole. Getting a good contact with the edge connector requires you to insert the battery and press straight down. It will click as it catches under the edge contact. Rechargers are designed to take various numbers of cells, various sizes and either/or lithium and nicad. A good charger will automatically stop charging when the cell is charged and provide some indicator the cell is ready. Overcharging batteries can damage them and even sometimes make them explode. blinking green: is not supposed to happen. However, mine does not seem to behave that way. I think they have changed the meaning of the lights. red means defective: charged as it will go. blinking red: means defective but charging. no light: battery inserted backwards or not connected. In other words blinking means charging, green means good. It automatically stops charging when done. It has a fan to keep the batteries cool while charging. It is a bit on the noisy side. It is important to check for battery leaking before the corrosion destroys the containing device. I treat all my battery contains with DeoxIT Red before using. This helps clean, reduce corrosion and improve conductivity. If you see any corrosion, discard the battery and clean off the contact thoroughly with contact cleaner such as DeoxIT Red. If you let it pass, the device will be become useless. I have a cupboard for batteries with jars for untested, known bad, known good batteries. The bad batteries have to be taken in from time to time to a recycling service. 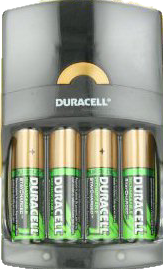 Batteries contain all manner of toxic chemicals, though mercury has been discontinued. Don’t let your young kids play with batteries. It is quite serious if they swallow one. Avoid handling the battery contacts. Finger prints and grease will reduce conductivity.